We’d love your help. Let us know what’s wrong with this preview of A Thousand Sleepless Nights by Teri Harman. Henry Craig is a writer—if only he could find the right words. While sitting at a worn table in a Detroit library he sees a new librarian, Matidla, and suddenl Is love stronger than grief? To ask other readers questions about A Thousand Sleepless Nights, please sign up. This is a lovely and heartbreaking book. I was completely absorbed in the characters and in their story. Teri Harman's writing made these people and places absolutely real to me. My heart was with the characters at every moment. I highly recommend this book. This story had an interesting concept and grappled with the question, is love stronger than grief? The synopsis on the back tells you pretty much what you need to know as you go into this book. I like that the author focused more on the couple’s relationship, not the horrible loss so much, and really showed what a loss their marriage would be in and of itself. I have very strong opinions of marriage and I believe marriage vows should not be taken lightly. So I liked that we saw what a loss of th This story had an interesting concept and grappled with the question, is love stronger than grief? The synopsis on the back tells you pretty much what you need to know as you go into this book. I like that the author focused more on the couple’s relationship, not the horrible loss so much, and really showed what a loss their marriage would be in and of itself. I have very strong opinions of marriage and I believe marriage vows should not be taken lightly. So I liked that we saw what a loss of the marriage would look like, something that had been nurtured for six years to suddenly disappear. Loss and grief stink. Grief has its purpose but should never be the death of something else. There is a little mystery of what has happened to this couple, I wouldn’t call it magic but it is something unexplainable. There is an appearance of a ghost. Not my thing but that is not a main focus and already I knew this story had a hint of ‘fantasy’. It put me more in the mind of my favorite Christmas movie, It’s a Wonderful Life, only the story is told two-fold by the husband and wife. The power of our words was another lesson shown quite well. I am also a big believer that we should be careful with what we say since our words can have such an impact on ourselves and others. And maybe that is where the ‘magical’ feel of the situation comes into play. All in all I liked this read. I was rooting for this couple throughout and couldn’t wait for them to be restored. Another way I would describe it would be a contemporary fairy tale. I received a complimentary copy of this novel. I was not required to post a positive review and all views and opinions are my own. This novel was an interesting way to explore the question of whether love is worth the grief that sometimes accompanies it. When Matilda tells her husband “I wish I had never met you” in a moment of utter grief, the two are instantly transported to separate locations whereupon they wake with no recollection of the last six years. What they do have are a book and a typewriter each—typewriters that can communicate with one another, no less! What would you do if you discovered the last six years ha This novel was an interesting way to explore the question of whether love is worth the grief that sometimes accompanies it. When Matilda tells her husband “I wish I had never met you” in a moment of utter grief, the two are instantly transported to separate locations whereupon they wake with no recollection of the last six years. What they do have are a book and a typewriter each—typewriters that can communicate with one another, no less! What would you do if you discovered the last six years had been erased from your mind, and then found your typewriter produced messages of its own accord? Messages of an intense love to parallel Song of Solomon. Maybe you’d think you were going a little crazy? For me, the driving question in this story was how and when Henry and Matilda would work out what they once were to one another. It was often a tumultuous emotional journey for them, with both feeling the kind of visceral connection to one another that would be natural for a couple who had been married for nearly six years, but all the while believing the other person to be a stranger. The author captured well what a confusing and unnerving experience this would be as they encountered one another and began to get to know one another again. There’s definitely some suspension of disbelief required for this story, which was fine for me until a particular part at the end involving a ghost. I won’t mention specifics so as to avoid spoilers, but ghosts really aren’t my thing. I was also a little uncomfortable with some of the support Matilda’s ex-fiancé gave her when she reappeared in her hometown. I hasten to add that he didn’t do anything wrong, technically, but considering he was married, I found myself a little jealous on behalf of his wife at times. Those things aside, this was an engaging read. My review of A Thousand Sleepless Nights by Teri Harman, author of the Moonlight trilogy (Blood Moon, Black Moon, & Storm Moon). A Thousand Sleepless Nights, a clean romance with a touch of magic, had me from the first pages, gripping my interest from the conversation between Matilda (the main character) and her dying Aunt Jetty. The themes in this story are strong and heart-wrenching as the reader travels on a measured journey of tragedy, heartache, tears, confusion, and longing. That being My review of A Thousand Sleepless Nights by Teri Harman, author of the Moonlight trilogy (Blood Moon, Black Moon, & Storm Moon). Don’t expect a fast-moving action-adventure, or even your average romance with this one. This is a leisurely-paced love story like no other. And the events in this book can be understood both figuratively and realistically as the author adds in a touch of the supernatural. Can I just say that the scene where the typewriter first starts typing by itself literally gave me chills. “Ax murderer? Annoying salesman? Fugitive? Nail biter?” She smiled as she said the last one and the tension in Henry’s gut eased slightly. A Thousand Sleepless Nights is a solid read, but don’t take my word for it . . . read it yourself. Can grief change your life? When her Aunt Jetty dies Matilda White leaves everything behind - her job, her fiance, her friends, her life. The grief is too much so she leaves Silent Fields, Kansas, behind in the middle of the night to start over. Henry Craig is a writer who can't put word to paper - the words are there but they are trapped within him unable to find release. Until he sees Matilda ~ Matilda gives his words release. Soon six years have passed and Matilda and Henry are about to leave the life they've created for themselves for a new one in Kansas City. But when something goes terribly wrong Matilda's grief is about to change everything Henry and Matilda have had together. Henry wakes up in a Detroit library and Matilda in her home in Silent Fields. Six years have passed but neither has any memory of it. Where did those six years go? And if you don't remember something does that mean it never happened? Silent Fields in typical small town fashion has come up with their own spins on where Matilda has been and where her unexplained scars have come from. But Matilda has no answers and her very silence adds to the speculation. Feeling at loose ends with his life having gone on without him Henry comes upon an old advertisement one that will at least give him a starting point from which to rebuild the life he once had. The editor of a small town paper seems like the ideal way to put his writing skills to work. And Silent Fields, Kansas, awaits. But Henry's arrival starts with chaos and a storm that finds him having to rely on the kindness of strangers. But when he has a chance glance at a stranger across the room he has a connection that sparks the creative juices that have long eluded him. Who is this woman who with a quick glance affects him so? And so begins a journey to discover what was lost - the only clues being a book with a personal inscription by an unknown author and an antique typewriter in the possession of both. This book has a thread of mystery that runs through a love story. For those who love or are at least familiar with It's a Wonderful Life and Portrait of Jennie (1948 movie with Joseph Cotton and Jennifer Jones) this book I would say is a modern (1990s) story that combines these two storylines into a uniquely powerful and moving story about the power of grief and love. If you could lose your grief and pain would you be willing to give up everything that went with it? How much is too much? Read A Thousand Sleepless Nights and discover what happens for yourself - you won't be sorry. This would make an excellent book club selection as there is much worth delving into and discussing. "I sit beside you and I breathe more air. I look at you and I see a universe. I touch you and I connect with everything that has ever lived. I kiss you and I exist." This story hooked me from the beginning. I love how this story is told, chapter by chapter from either Henry or Matilda's point of view. You were able to connect to both characters so much by having the novel written this way. I'm not going to go into details about what happens in the story because you can read that yourself up above. Instead, I want to tell you about a few other passages that really affected me. This book is very much a lesson in learning to live after grief. Henry is given advice about dealing with grief from Abby, an older woman who took him in and treated him like a son. Abby was childless after losing eight children, from miscarriages',a stillbirth, and an infant death.Abby knew and had lived with pain. She told him, "After each one,I wanted to give up.I wanted to hide from the pain I had and the possibility of more pain.But after I stopped hurting so bad I couldn't sleep, I realized something else. Fearing the pain also kept me from the chance of having some joy. And Henry, joy is worth the pain." Wow! Those words shook me to the core and spoke to me so much. The only way I can describe how I felt is another passage I read in the book describing how Henry felt after reading a certain book, "Each word lingered inside him, like bees in a hive buzzing." 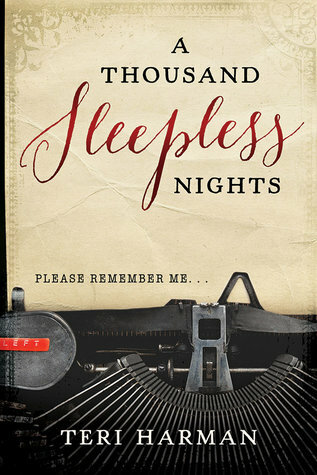 A Thousand Sleepless Nights by Teri Harman is a beautiful book about life, love and grief. It is set in the 1990's. This book is such a beautiful read in spite of it being a study in grief. Grief may consume us as we drown under its weight. "You need a reason to live after a tragedy." Picking up the pieces is not always easy. How do we begin to live again when all we feel is pain? "Sometimes it takes someone else to heal our pain." We don't always know what we need. What would it feel like to wake A Thousand Sleepless Nights by Teri Harman is a beautiful book about life, love and grief. It is set in the 1990's. What would it feel like to wake up one day and realise the last six years of our lives were missing? What tragedy befell that our mind shut it out? Or are we just going mad? "What... had stolen her memory and broken her mind?" Grief can do strange things. We need to heal our pain. Others stand beside us showing unconditional love. "That Abby gave him all that without question surprised him." Some people have huge hearts that extend love to those in need. Everyone has scars. Some are visible, others not. "You have scars too, old and new." Great love does not die. It lasts beyond the grave. A Thousand Sleepless Nights is such a beautiful read, even in its pain. The reader 'feels' the great love. Love that persists in spite of pain. This is a very unique story and one that I loved. It is impossible to read this book and remain unchanged. The love, the pain, the grief reach out from the pages to touch the reader's heart. A Thousand Sleepless Nights is a romance/drama with just a hint of magical realism. I'll be honest, this isn't the kind of book I normally read, which makes it all the more impressive to me that I loved it so much. It was a literal page-turner for me, and I found myself rushing back to it as quickly as I could until I finished it. Even though the premise of the plot depends on a little magic (a couple wake up six years after a tragedy not remembering each other or anything that happened), the dia A Thousand Sleepless Nights is a romance/drama with just a hint of magical realism. I'll be honest, this isn't the kind of book I normally read, which makes it all the more impressive to me that I loved it so much. It was a literal page-turner for me, and I found myself rushing back to it as quickly as I could until I finished it. Even though the premise of the plot depends on a little magic (a couple wake up six years after a tragedy not remembering each other or anything that happened), the dialogue, reactions, and interactions between the characters feel grounded, real, and honest. Harman does a great job building up the tension of the plot, using the dramatic irony of the couple's situation to great effect. The whole book is basically one steady crescendo, peaking in a thoroughly satisfying but fully believable resolution. Wow. What an intriguing concept! Teri Harman managed to answer the question, "What would happen if you just forgot things when something bad happened to you?" The love story in this was thrilling and relatable. Don't we all stumble in life sometimes? When the pain hits, don't we all just want to run away? I loved the small town feel and characters to this. I think that Abby was probably my favorite! She is darling and supportive and makes the FUNNIEST comments. As a mom who's Wow. What an intriguing concept! As a mom who's lost a child to SIDS, this really hit home for me. Everyone's grief is so different. But, just as the book says, it's dark and heavy. Not a burden I'd wish on anyone. Parts of this book really gutted me and gripped me. I also thought it was kind of hilarious when Parker got punched. Not that he's a bad guy or anything, but because the draw to these characters is so real. I will say, I was a bit impatient to understand how they would eventually get their memories back. I wanted them to have them sooner, but that's because I'm an impatient person and I can't imagine going through the grief of losing a child without my husband. All in all, the writing in this was beautiful! I think I'd give this a solid 3.5 stars. I enjoyed the book. I found myself a little unsure about the direction of the book near the beginning when the tragedy occurs, not quite sure if I was going to “go along” with the suspension of disbelief. But I eventually did find myself engaged in the story and rooting for these characters. Everyone who has experienced grief and deep sadness (which is pretty much all of us, in this human condition) will identify with the feelings exposed in the book and I think I'd give this a solid 3.5 stars. I enjoyed the book. I found myself a little unsure about the direction of the book near the beginning when the tragedy occurs, not quite sure if I was going to “go along” with the suspension of disbelief. But I eventually did find myself engaged in the story and rooting for these characters. Everyone who has experienced grief and deep sadness (which is pretty much all of us, in this human condition) will identify with the feelings exposed in the book and want to see healing start; all of us yearn to find love, friendship, belonging and understanding. The writing is lovely and I enjoyed the setting and the descriptions of Jetty and her house, as well as the library and bookstore. Such neat places they would be to visit. I personally know Teri Harman and she has written some reviews for my book review website, Rated Reads. I accepted the offer of an ARC to review and have sought to write as unbiased a review as possible. This book was very capturing. It was an easy read but I could not put it down once started. I loved that I couldn't predict the outcome...I had to keep reading to see what would happen next. I was able know the characters through great descriptions and felt like the setting was alive in my imagination. It gave me a Gilmore Girls feel which I loved! I would highly recommend this great love story! This is a book about love and loss. Matilda and Henry fall in love and get married. But a tragic accident erases six years of their lives. I enjoyed finding out how their lives cross again and how they work through the pain they both carry. There is a creative, somewhat mystical part of the story that I enjoyed going along with. This is an easy, enjoyable read. With every descriptive sentence, the reader quickly connects to each main character. One becomes emotionally attached and cries, laughs, and cheers on Matilda and Henry throughout the book. This was one of those "difficult to put down" books. It was a good read but not a page turner. I loved the concept, the love letters got a bit sappy for me but it was worth reading. A beautiful and powerful story about love and grief. Loved it! Beautiful story of loss, grief, and love, but sometimes Matilda's choices made me crazy. I was intrigued by the time-travel element. There's a lovely, old-fashioned, enduring quality to the story. So good!!! I loved this book. I could not put it down especially towards the end. Enjoyable but so many grammatical errors. Not sure if that was from taking to the ebook format or not. Thought the ending was a little predictable. Teri's writing is extremely intriguing. I love her description of events and her use of words. This is my first book by Teri and I am impressed. "The beast in Matilda's gut had rumbled awake with a bitter growl"
Just one example of a sentence that sucked me in. I wanted to keep reading but also never wanted it to end. This magical perspective of grief was very inspirational. I felt like each page offered a sweet little lesson and the book had an overall positive vibe. Teri Harman is the author of The Moonlight Trilogy, a witch fantasy series, and the magical romances, A Thousand Sleepless Nights and The Paradox of Love. For many years, she’s written about books for ksl.com, reviewed books for The Deseret News, and contributed book segments to Utah’s number one lifestyle show, “Studio 5 with Brooke Walker.” Her fiction won first place in the “Romance Through the Teri Harman is the author of The Moonlight Trilogy, a witch fantasy series, and the magical romances, A Thousand Sleepless Nights and The Paradox of Love. For many years, she’s written about books for ksl.com, reviewed books for The Deseret News, and contributed book segments to Utah’s number one lifestyle show, “Studio 5 with Brooke Walker.” Her fiction won first place in the “Romance Through the Ages Contest” in 2016 and Kirkus Reviews called her work “unusual and absorbing.” She has taught classes and workshops for writers all over Utah. Teri is also a certified yoga instructor (RYT-500) and has a degree in exercise and sport science from the University of Utah. She lives in Utah with her husband and three children. Visit her at teriharman.com.